As shown in the photos posted below, this Sunday's rally was a full house. Kudos to all the organizers and participants who are making sure their voices are heard. NEW YORK — Council Member Fernando Cabrera, elected officials and city religious leaders lead a mass march across the Brooklyn Bridge yesterday, Sunday, January 29th, 2012. 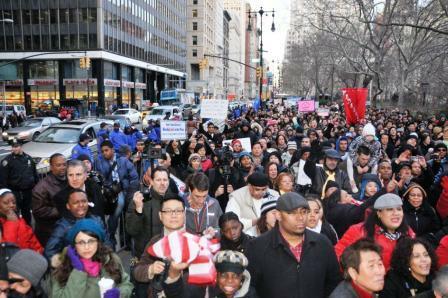 Marchers urged Mayor Bloomberg and the Department of Education (DOE) to reverse the discriminatory policy that will evict Houses of Worship from public schools on February 12th. The march began at Cadman Plaza, continued over the Brooklyn Bridge and ended in front of City Hall on Broadway. New York City Police Department Community Affairs personnel escorted the marchers throughout as marchers sang prayer songs and chanted motivational words. Marchers are also urged legislative action. The City Council should pass Resolution 1155 which calls upon the New York State legislature to pass and the Governor to sign legislation amending the New York State Education Law to afford houses of worship maximum access to school property. The State legislation includes NYS Assembly Bill A8800 and NYS Senate Bill S6087 that would amend NYS Education Law 414 to allow Houses of Worship to meet in schools regardless of the “worship” component of their activities. After the Supreme Court declined to hear Bronx Household of Faith vs. New York City Department of Education on December 5th, 2011, the New York City Department of Education announced it would ban Houses of Worship wishing to rent vacant spaces from Public Schools during non-school hours. Following the announcement, Council Member Fernando Cabrera and Religious Leaders have organized several protests. These include a Prayerful Protest on Thursday January 5th, where Council Member Fernando Cabrera, pastors and congregants were arrested for kneeling in front of the New York City Law Department in prayer during a display of civil disobedience, and a Prayer Rally during Mayor Bloomberg’s State of the City address on Thursday January 12th, where approximately 500 pastors and congregants gathered for prayer and song and over 40 were arrested while approaching the entrance of Morris High School in another display of civil disobedience. A press conference was also convened in front of the Tweed Court House on Wednesday, January 18, 2012, where 50 pastors, congregants and elected officials participated before marching to City Hall for the New York City Council Stated Meeting. The January 29th March on the Brooklyn Bridge was the largest planned demonstration to date. Councilman Fernando Cabrera has served the 14th Council District of the Bronx since January 2010 and as senior pastor for New Life Outreach International in the Bronx since 1988. Labels: ", "Bill de Blasio", "Brooklyn Bridge", "DOE", "Eviction of Houses of Worship", "Fernando Cabrera", "John Liu", "Marcos Crespo", "Mayor Bloomberg", "Resolution 1155", "Ruben Diaz Sr."
Here is another bill proposed by Sen. Klein reinforcing his stature as a "law and order" politician. Besides cracking down on auto theft and thieves that prey on houses of worship, he is now protecting the community from drivers who operate motor vehicles with fraudulent insurance cards. ALBANY, NY – Legislation sponsored by Senator Jeffrey D. Klein (D-Bronx/Westchester) that would impose tougher penalties on those who commit auto insurance fraud passed the State Senate today. The measure (S.578) would make it a felony to forge an auto insurance card, or certificate of insurance. In New York State, these documents are necessary to obtain government issued documents -- such as a vehicle registration -- that are required to legally operate a motor vehicle. Forged insurance cards and documents are often used to fraudulently register cars so that owners may operate them without paying auto insurance premiums. Klein’s bill also makes the selling of 10 or more false insurance cards or documents a felony. Labels: "Car Insurance", "Fraudulent Insurance Cards", "S.578", "Sen Klein"
Here are the details related to the recent thefts targeting houses of worship in the North East Bronx, and the new legislation prospered by Sen. Klein. 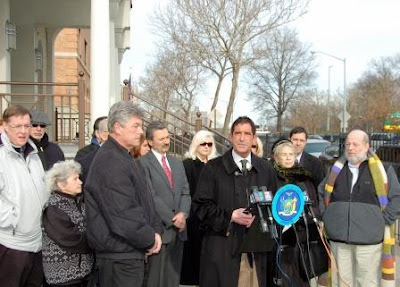 PELHAM BAY, BRONX, N.Y. – Following a rash of break-ins and burglaries targeting houses of worship in the Northern Bronx, State Senator Jeffrey D. Klein (D-Bronx/Westchester) today announced legislation to stiffen criminal penalties for those who steal, or damage items and property in churches, synagogues and other religious institutions. He was joined by religious and community leaders who have been stung by these crimes. In the Waterbury-LaSalle Community, Our Lady of Assumption Roman Catholic Church parishioners noticed a laptop and approximately $400 were stolen from their school. Additionally, a door leading to the chapel was broken. In Pelham Bay, Zoodohos Peghe Greek Orthodox Church was victim to about $50 being taken from donation box and the destruction of an intricate wood carving in the Church. Additionally, two months prior at St. Theresa Catholic Church their gift shop was broken into and cash was stolen from the register. On City Island, Police found windows and doors smashed and broken at Temple Beth El Synagogue and silver Torah crowns and Kiddush cups missing. They estimate $5,000 to $10,000 worth of items were stolen. Increase the penalty for theft, or the intentional damage to a scroll, religious vestment, vessel, any other item used in connection with religious worship, in any building of worship punishable, to a maximum of seven years in prison. These crimes would be classified as third-degree grand larceny and second-degree criminal mischief, both Class D Felonies. Currently, these charges would only apply in cases where items worth more than $3,000 have been stolen, or where items have sustained more than $1,500 in damages. Expand the definition of second-degree grand larceny to include the theft of any scroll, religious vestment, vessel, any other item used in connection with religious worship, in any building of worship, that are worth more than $250. This would be a Class C felony punishable by up to five to 15 years in prison. Strengthen the penalty for any intentional damage to house of worship-owned property to up to four years in prison, making it a Class E felony. Currently, this applies to damage worth more than $250. If passed, this legislation would build upon Senator Klein’s past legislative accomplishment of increased criminal penalties for those who desecrate and vandalize church property. That bill was signed into law by Governor Paterson in 2010 and was strongly championed by a wide range of religious leaders, including Archbishop Timothy M. Dolan. “A crime against a religious institution is a crime against a community at large,” said Monsignor Anthony Marchitelli of Our Lady of Assumption Catholic Church. “It is urgent that all people of good will stand together against violence that target our houses of worship. We thank Senator Klein and his colleagues for their leadership in helping lift us up, so that all of our brothers and sisters of faith can congregate and worship in safety and peace,” said Rabbi Shohama Wiener of Temple Beth El Synagogue. Those who have any information on these recent burglaries against religious institutions are urged to contact the 45th Precinct Detective Squad at (718) 822-5414 or Crime Stoppers at (800) 577-8447. Labels: 'Synagogues", ""Sen. Klein", "Churches", "Our Lady of Assumption", "Religious Institutions", "Temple Beth El Synagogue", "Zoodohos Peghe Greek Orthodix Church"
It is heart breaking to hear thieves are targeting Houses of Worship. Fortunately, State Senator Klein is proposing legislation to help put an end to it. Kudos for Klein’s consistent tough stance on crime. BRONX, N.Y. – State Senator Jeffrey D. Klein (D-Bronx/ Westchester) will be joined by local religious and community leaders to unveil new legislation that would stiffen penalties on thieves who target religious institutions. The announcement comes on the heels of a rash of break-ins and thefts in the past month at Bronx churches and synagogues. The announcement will take place in front of Zoodohos Peghe Greek Orthodox Church, the target of a break-in and burglary on January 7th. WHO: Senator Klein, Zoodohos Peghe Pastor, the Rev. Sylvester Berberis, Parish Council President John Korres, Rabbi Shohama Wiener of Temple Beth El, Temple Beth El Council President Paul Klein, the Rev. Michael Challinor of St. Mary's Star of the Sea, as well as parishioners, community leaders and representatives from the Waterbury LaSalle Community Association , the City Island Chamber of Commerce, Community Board 10, Pelhem Bay Taxpayers and Civic Association, and others. WHAT: Press Conference announcing new legislation to stiffen criminal penalties for thieves who target houses of worship. Labels: "CB 10", "John Korres", "Paul Klein", "Rabbi Shoham Wiener", "Rev. Sylvester Berberis", "Senator Klein", "Zoodohos Peghe Greel Orthodox Church", "Zoodohos Peghe", Rev. Michael Challinor"
There is a free informational event to educate parents on NYC public school options. The forum and website could be helpful if you have children on the NYC Public School system. If you are interested in attending please note the RSVP deadline. Here at the NYC Council, we realize how important it is to give our city's kids a strong start in life. A vital part of gaining that advantage is finding a great elementary school for your child, beginning with kindergarten. Admission is FREE but you must RSVP to centernyc@newschool.edu. If you or someone you know is planning to enroll a child in elementary school, this will be a great opportunity to learn more about the enrollment process from the experts at Insideschools.org and to have your questions answered by a panel of experts. We will also have a brief "buzz" session afterwards, where parents will be able to further discuss any additional concerns that they have with Insideschools.org's freelancers and staff members. This is a wonderful opportunity to learn more about how to give your child the education he or she deserves. We hope you can make it! Here is information taken from the "Inside Schools" website defining who makes up the organization and what their purpose is. We are journalists, public school parents, and public school advocates dedicated to providing the best independent information about New York City's public schools. We want to tell you what's really going on, because test scores don't tell the whole story. We visit hundreds of schools each year and interview thousands of people--principals, teachers, students and parents. We observe what’s happening in the classrooms, cafeterias, hallways and even the bathrooms. Founded by the nonprofit organization Advocates for Children in 2002, Insideschools moved to theCenter for New York City Affairs at The New School in November 2010. The move was made possible by a grant from the Alfred P. Sloan Foundation. We receive no money from the Department of Education. Labels: "Councilman Robert Jackson", "Inside Schools", "NYC Public Schools", "Speaker Quinn", "Theresa Lang Community and Student Center"
From the video below it seems as if a Queen’s community is attempting to gain control of a swatch of “abandoned” buildings in their neighborhood. As properties increasingly fall into decay and the need for affordable housing increase, these types of land transfers could become more common much like they were in the 70’s when the "Bronx was burning". The legal details are not made clear in the video but even if the property does have a legal owner who is paying the necessary taxes on the property, should the ”community” be able to take possession of a property if it is meets certain criteria. Can parallels be made with the government’s uses Eminent Domain? Another interesting point is the fact that the Fordham 99% Club and other 99% Clubs are supporting the Hollis Community in their Endeavour. Is this action one of the examples of how the 99% movement is evolving? Labels: ", "Fordham 99% Club", "Hollis Development Corporation", "Hollis Presbyterian Church"
Frank Zappa on Education: Was he Right?